NBYC sails on Wroxham Broad from April through to October. We take particular pride in promoting all aspects of competitive racing as well as encouraging more leisurely and relaxed sailing on weekday evenings. The Yeoman fleet at Norfolk Broads Yacht Club is one of the largest in the country with over 20 actively sailed boats. We have competitive fleet sailing with two races most Sundays during the season, and combined fleet sailing on Saturday afternoons and Wednesday evenings. We hold four Yeoman 'weekends' every season, each with its own trophy. Three of these are open to non-members and the fourth is a closed, members-only event. Each weekend consists of four races and can be very competitive with a high standard of racing. 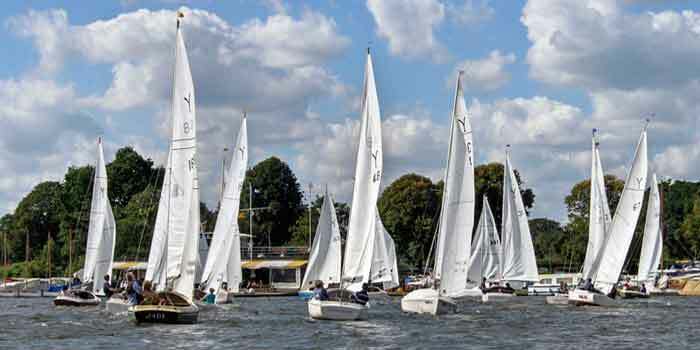 There are several other club regatta weekends during the season and of course Wroxham Week in July, which offers two Yeoman races each day. We actively encourage and support new sailors. Boats can be kept afloat in easy access pens or ashore with free use of the club crane for dry sailing. The clubhouse facilities are excellent with bar and catering and wonderful views across the Broad. Plenty of green areas around the clubhouse and a children's playground make NBYC an excellent family club, which provides extensive training programmes in Optimist and Topper sailing as children get older. The fleet has an excellent social programme, with Saturday evening events at all of our class weekends. Other events,include our annual winter walk and the Wroxham Week picnic. We also organise 'Yeoman tables' for club events, such as the Fitting Out Supper. The club now owns three Yeomans which are available for hire to members, either for racing or cruising. These are also used for adult training and the club runs several adult courses during the year. For more information, please contact Michael, Frances or Daphne as detailed above. Bill and Diana Webber have produced some guidance leaflets to help sailors unfamiliar with NBYC features and facilities. Click the relevant button to see a pdf which can be downloaded and printed.